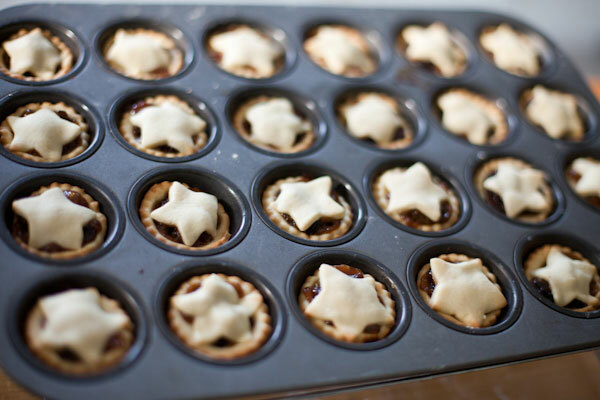 Christmas would not be Christmas in England without a mince pie or two – or three or four. This easy recipe is the best way to all get into the kitchen together to cook – kids love rolling and cutting out the dough and dusting with glitter. There’s no better way to kick off the holidays than a little baking as a family. 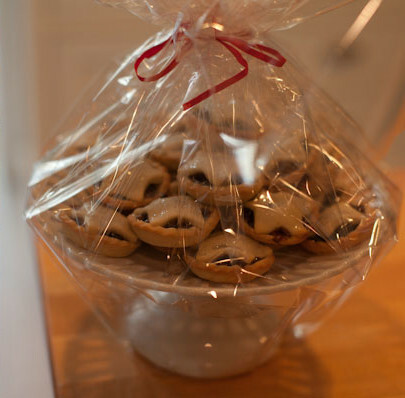 Let’s be clear these little sweet pies have no meat in them – the word mincemeat comes for medieval England when spices brought back from the Crusades were mixed with fruit and shredded meat and put into pies – traditionally eaten at Christmas time, sometimes called manger pies. Over hundreds of years these pies have shifted from savory to sweet – and have become classic Christmas treats. As you bite in to your first mince pie remember to make a wish! They are quite labor intensive and it’s worth making up double if you can – believe me they go very quickly. I think these are the perfect mince pies – two bites of sweet filling with just enough pastry to make a neat little pie but not too much so as to be cloying. I’ve moved away from a flaky shortcrust pastry to use pâte sucrée a sweet dough enriched with egg that bakes up more like a cookie – but either works really well. For the filling I took a handful of golden raisins, a handful of Zante currants, 1/4 cup of apple sauce, a generous 1/2 cup of Rémy Martin Cognac and lots of mincemeat (about 1 1/2 cups) – mixed it all up, kept it in a Weck jar in the fridge and then fed it with cognac – you can make it from scratch months in advance (as per Yotam Ottolenghi’s instructions to me for his secret to the best mince pies) or you can cheat and use it from a jar (Crosse and Blackwell makes a good Mincemeat using heirloom apples that’s pretty decent once you’ve added the other ingredients). Mix it all together to get a thick consistency. As the alcohol macerates the raisins they will plump up. 1. Place flour, sugar, salt and butter in the food processor and blitz until the mixture resembles sand. 2. Add the egg to form a soft dough. 3. Wrap the dough in plastic wrap and refrigerate for at least an hour. I keep a batch made up in the refrigerator over the holidays to make up a batch of mince pies at a moments notice – they are best fresh from the oven! 4. Preheat the oven to 350 F.
5. Place the pie pan in the freezer to cool off. Once the dough has rested roll it out between two pieces of plastic wrap to 1/8 inch thick using your Pastry Wands to get the perfect even thickness. Cut out the circles of pastry and gently place in each pie space. 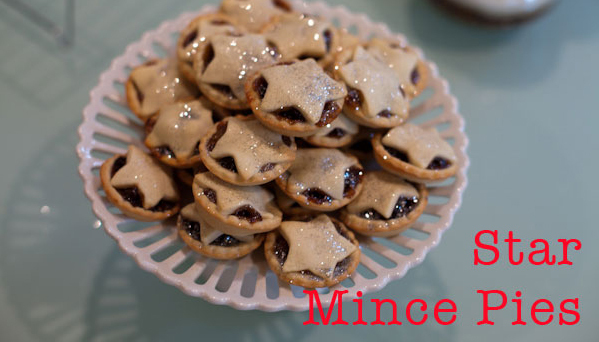 Place a small amount mincemeat in each and top with a pastry star. You can use an egg wash on the stars before putting them in the oven if you want shiny mince pies or leave them for a more matte finish. 6. Bake in the center of the oven for 7 – 10 minutes until the pastry is a nice golden brown on the bottom. 7. Cool on a wire rack and then transfer to a cake stand. Dust with confectioners’ sugar for a snow effect or if you are feeling in a gittery mood a light dusting of edible glitter for that extra sparkle and eat – don’t forget to make a wish!